Slavery never ended with the infamous slave trade from the 16th century in Africa. It seemly took a new dimension with our own black brothers stealing the ideas of slavery from the white men and reforming it to cope with modern realities. Corporate slavery has gained much prominence in Nigeria. It has been heavily linked with the banking industry and other FMCG companies especially the ones owned by Koreans, Indians, Lebanese and Chinese people in Nigeria. As for the banks, they tend to shop for young, energetic and brilliant chaps around the age of 23 to 26 years who are not really thinking of concrete plans in life rather than having some fun-filled relationships for mind-blowing experiences, acquiring the latest technological innovations, designer clothes and maybe a car to make them feel recognized in the social setting. The bank virtually buys their entire time over a huge sum of money compared with other establishments. Some workers resume as early as 6:30 am in the morning and close as late as 11pm only to reach home at 12pm. This trend continues on and on till the day the bank relieves them of their services untimely due to reformation or economic issues. Then they come out to see the outside world they have been secluded from feeling like strangers. 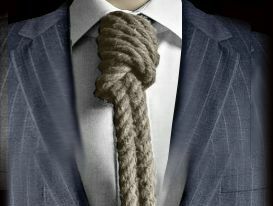 That tie attached to their necks in the corporate society is very much symbolic, it is a sign of slavery, and it depicts the hold and influence of the capitalists. Even when it is hurting and your long neck needs a breathing space you are not allowed to take it off. A worker could be heavily sanctioned for gross misconduct if found guilty. What about the labourers at factories in Nigeria owned by foreigners who work from 6am to 6pm with a short break only to earn peanuts. These are trade practices that are not in play in their countries but since Nigeria is a country where the poor doesn't have a voice, they hijack the loophole to cheat people in their own country. That is a huge slap on the country's face. A cross-section of jobs in some other states aside the commercial city Lagos reveals some jobs are simply no jobs at all. This creates a difference between ''WORK'' and "WALK''. This could be hilarious but it’s real. Conventionally, we Nigerians mostly pronounce them the same way while they are two different terms with differing pronunciations. The bottom line is that most jobs in other states depict a vivid image of under-employment in the Nigerian economy. There are not jobs in the real sense but a mere activity just to keep the body and brain busy because an idle hand is the devil's workshop. Most people just work in these states in order to have a means of identification when harassed by the men of the Nigerian police who are unrepentantly after bribes for no just cause. Most salaries never correlate with the qualifications of the employee or the services he offers. The employees are always at the receiving end, offering more and getting less pay. This is a close shave, the poor lack a voice and even when they get a voice, they realize virtually nobody is listening. Leaving your job due to maltreatment or abuse is always a wrong decision that attracts so much regrets because they are always a thousand and one applicants out there warming up to take your spot with a lesser pay and compounded abuse. This has become a stringent case of the survival of the fittest in an ecosystem. Is there really a solution to corporate slavery? That's a rhetorical question. It all lies in the hands of the government to improve the ailing status of the dwindling Nigerian economy. The government on the other hand seems helpless with Governors of 18 states out of 36 states proudly owing their workers' salaries over a lengthy period of time. Governor Rauf Aregbesola of Osun state who is a ''front liner'' tops this list with a staggering 6-month of non-payment which just increased to 7 months. What about the great philanthropist, Governor Rochas Okorocha of Imo state who owes the primary school teachers in his state arrears of 13 months. Many other cases also follow. It is crystal clear that even the public sector which is the highest employer of labour in Nigeria has been badly hit to. 1) Not having a clearly stipulated job description or working out of your job description with due benefits. 2) Theoretical promotion which entails no pay. 3) Lack of work benefits, health insurance or a pension package. 4) No recognition of public holidays. 6) No clearly stipulated closing time or overtime benefits. 7) Being engaged in cleaning, running common and unofficial errands, power supply issues as a higher institution graduate. 8) Constant abuse and use of swear words by your boss. 9) Minute salary gulped by transport and feeding costs alone. 10) Conventional delay of payment of workers' salaries. 11) Unprecedented queries and incessant meetings on flimsy issues. 12) No definite or agreed leave period from work. 13) Rigidity in obtaining permissions from work to engage in private issues. 14) Working without a contract agreement. 15) Lack of freedom on the social media as you are being coerced to represent their brands on social media platforms like Facebook, Twitter, Linkedin and the rest. These are a few I could mention. The list is endless. You end up adding more after listening to the painful plight of more employees in Nigeria. On an inspirational note, if you are facing any of these painful ordeals, I urge you not to give up, make the best of the opportunities given to you and get better. Develop an impressive resume for a greater job ahead. Stay focused and optimistic. What doesn't kill you was designed to make you stronger. The ruling class may NOT make a 'CHANGE' but the Village Town Crier will never stop exposing the excesses of the society. History shall record that the truth was told by a passionate and lowly Village Town Crier. My pen retires here for today.